Who among us isn’t fantasizing about escaping to a secluded beach, wishing to be stranded on a patch of fine golden sand and laze around in the sun all day? Unfortunately, we wait for months for that perfect getaway only to find ourselves stuck in the same old drill: crowds, noise and long lineups at popular waves. What if I told you that there are still a few beach hideaways across the globe that offer plenty of adventure-packed watersports as well? They may not be exactly undiscovered, but they are hidden gems in the true sense of the word, and locals will do anything in their hand to prevent the tourism industry from destroying their laidback vibes. Out of the bunch, we’ve handpicked 10 secluded beaches you absolutely need to see in your lifetime. Hurry up before the crowds beat you to it! 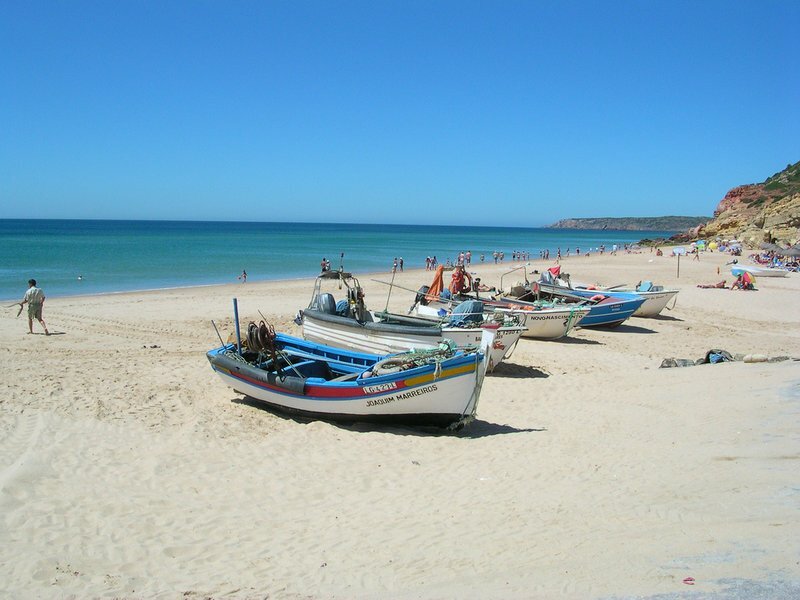 Three hours south of Lisbon, near Cape Sagres, lies a half-mile (0.8 kilometers) long beach with powdery golden sand. 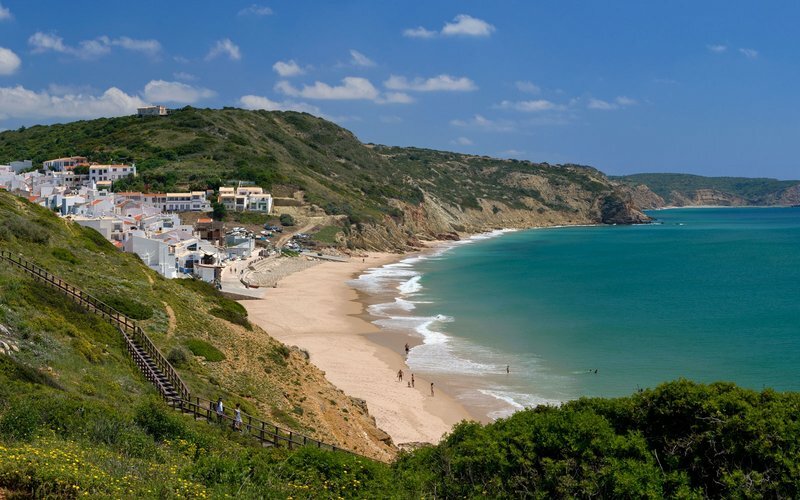 Set on the Algarve Coast, a popular tourist destination that’s rapidly developing, Salema managed to preserve its old-world charm and pristine beauty – there is only one main street, white stucco houses and a cobbled stone alley leading to the beach. The small fishing village is home to one of the quaintest and most unspoiled beaches in Portugal, a wide stretch of sand between two steep cliffs. 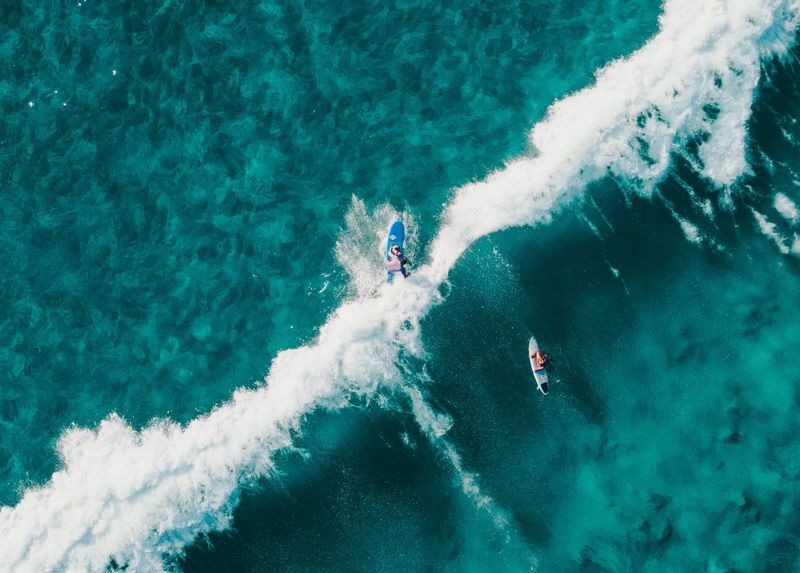 The crystal-clear waters receive a gentle Atlantic swell that fuels a quality beach break for some relaxing surfing and windsurfing sessions. One of Turkey’s best-kept secrets, the small coastal village of Cirali on the Lycian Way near Antalya is embalmed in mythology. This small pebble beach opening to the azure Mediterranean has been the proud nesting site of the endangered loggerhead sea turtle for over 40 million years. 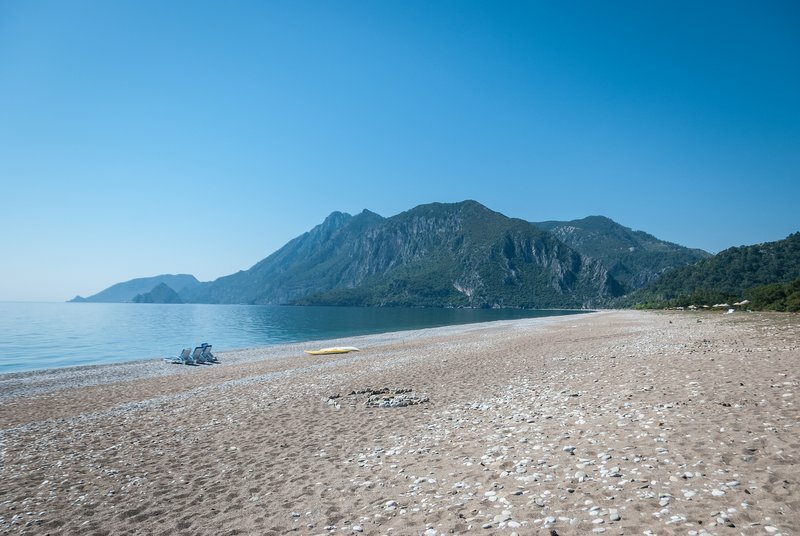 The ruins of the ancient city of Olympos are a 30-minute walk from the beach. The Eternal Flames of Chimaera are also found within walking distance from the village of Cirali. 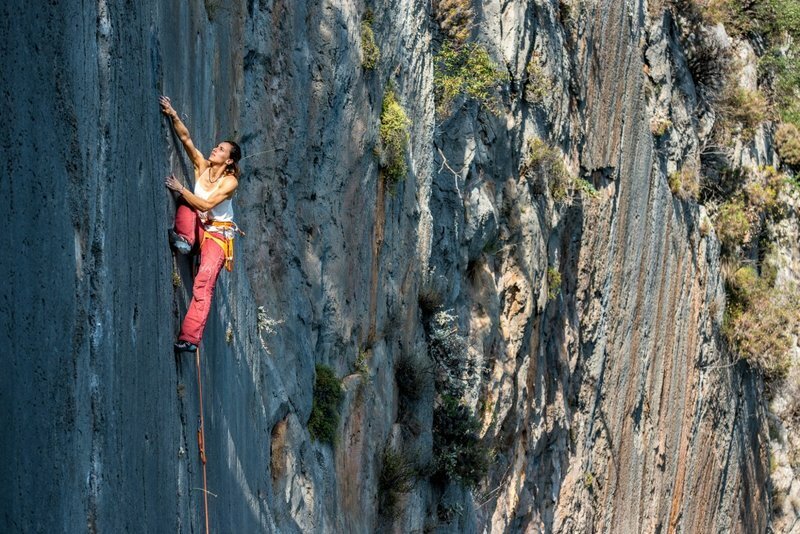 Besides swimming, snorkeling, hiking and exploring the many ruins and rock-cut tombs, you can also try rock climbing on the perfect limestone walls that offers routes for all levels. During warmer months, Olympos has some world-class deep-water solo climbing spots to offer, which can only be reached by boat. 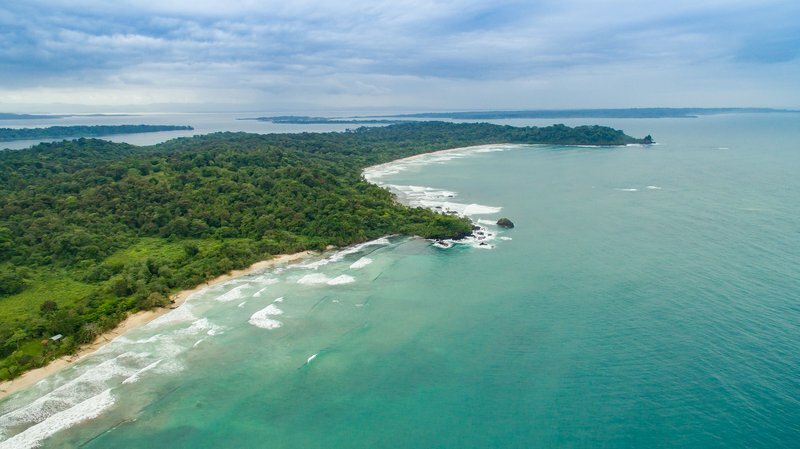 Off the east coast of Panama, Bocas del Toro is an archipelago of nine Caribbean islands packed with brilliant beaches. 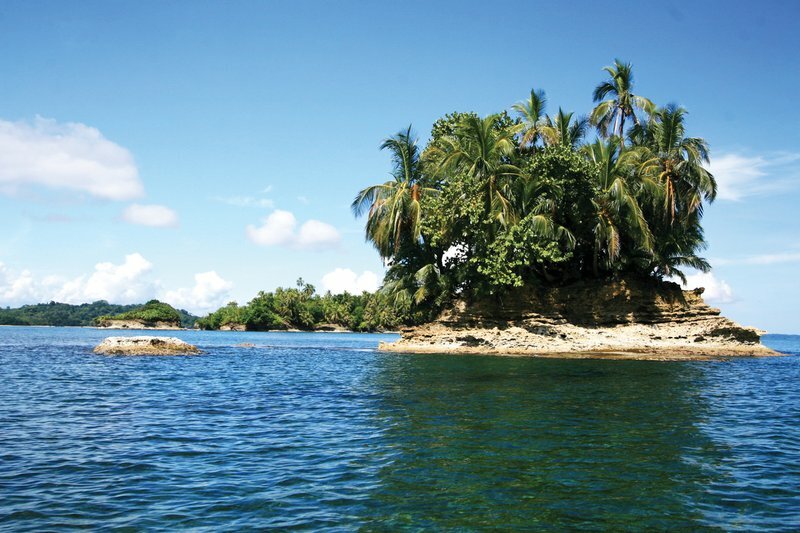 For a true sense of seclusion, visit the uncrowded north shore beaches of Isla Bastimentos. Playa Wizard, also referred to as First Beach, is considered one of the most beautiful on the island. The wide stretch of sand is home to a nice beach break that will delight surfers and bodyboarders. East of Playa Wizard, don’t miss the chance to spot the red-poison dart frog that thrives in the forests surrounding Red Frog Beach. Parque Nacional Marino Isla Bastimentos offers excellent snorkeling, and so does Cayo Crawl, a shallow channel where colorful tropical fish and other marine life can be observed. 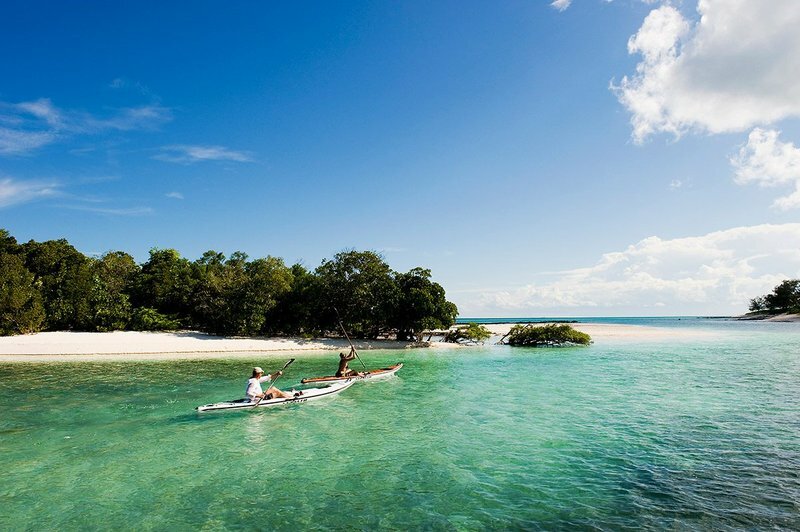 Off the northern coast of Mozambique, in the Indian Ocean and literally on the edge of nowhere, the Quirimbas Archipelago consists of 32 coral islands. 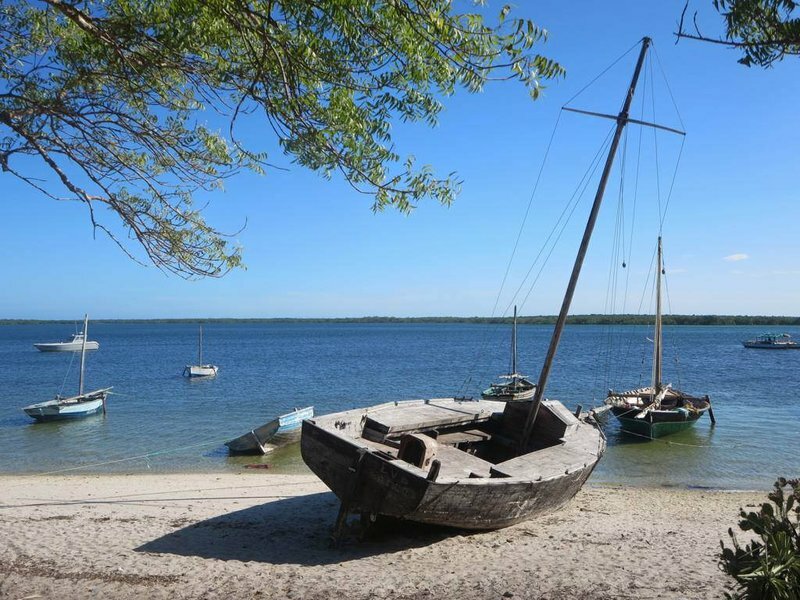 Among them, the Ibo Island is one of the oldest settlements in Mozambique, a trading post dating from around 600 AD. It is the most accessible of the Quirimbas islands, and also the most historically rich, with stone architecture bearing Arab, Indian and Portuguese influences. 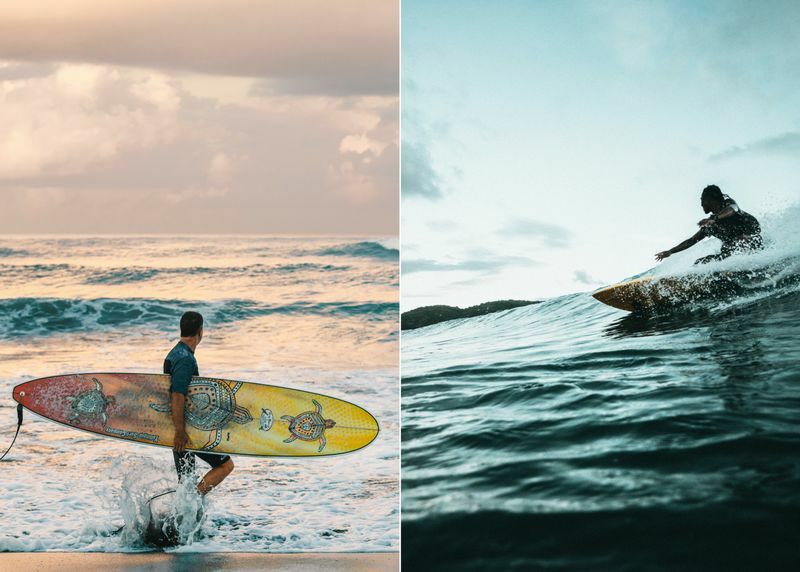 If you prefer diving to surfing, then you’re in for a treat. With an abundant display of marine life, sparkling turquoise waters and a handful of shipwrecks, Ibo is a deep-sea diving and snorkeling paradise. Take a ride in a dhow (traditional African sailboats) to secluded sandbank beaches and a kayak or SUP ride through the mangrove forests and along the ever-sunny coastline. One of Thailand’s most beautiful islands, Koh Lanta is famous for its unspoiled beaches bathed by the warm Andaman Sea (an average of 26 °C (80 °F) all year round). Most developed areas are found on the northwest side of the island, so the further south you go the less crowded the beaches become. 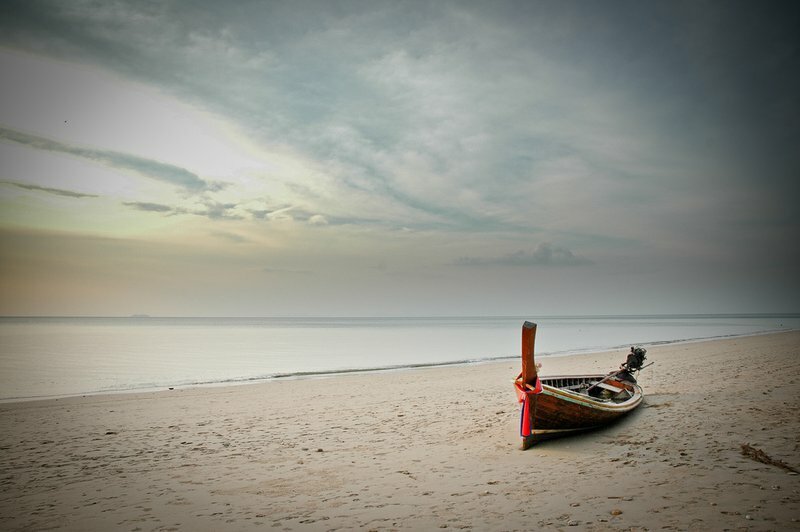 While here, stay in a fishing village with traditional stilt houses for a true sense of Thailand’s culture. Less than an hour’s ride by boat from Krabi, there are nine enchanting beaches on the western coast of Koh Lanta, with colorful coral reefs snorkelers will have fun exploring. Klong Dao Beach is the best surfing spot on Koh Lanta, located in the north of the island. The wide bay, almost 1.2 miles (2 kilometers) long, has a shallow sandy bottom that offers some nice waves for all levels. 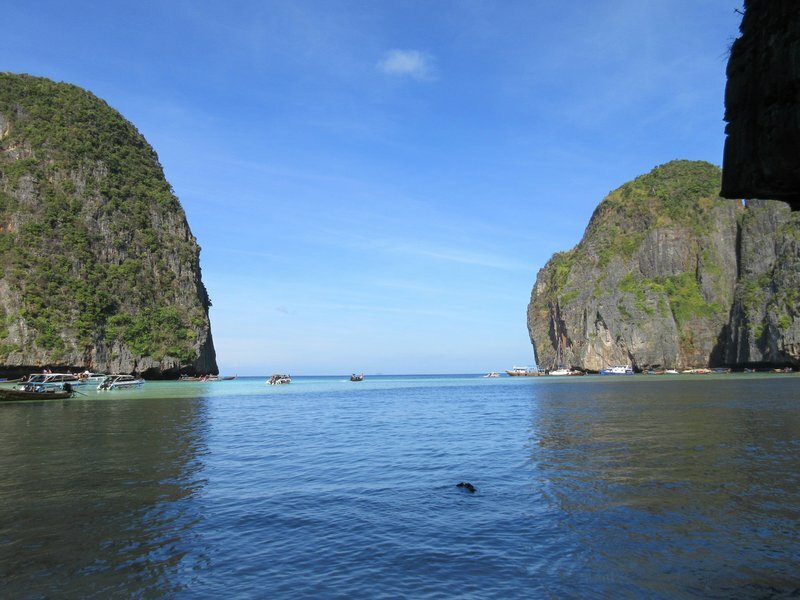 For some off-the-beaten path adventure, go kayaking and stand-up paddling on the azure Andaman Sea. 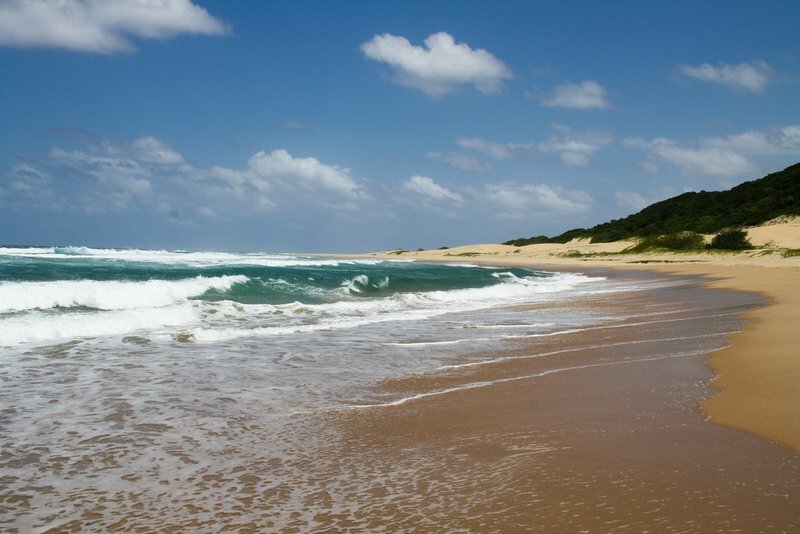 This pristine tropical beach on the northeast coast of South Africa is one of the hardest to get to in the world. It takes multiple plane rides to get to KwaZulu-Natal province, then a 4X4 ride through the forest, but it all pays off in the end. The golden-sand beaches offer access to some of the world’s best diving and snorkeling, with butterfly fish, angelfish, octopi, mantle rays, even dolphins and whales coming incredibly close to shore. Rocktail Bay is part of the Mapatuland Marine Reserve and is located within the Greater St. Lucia Wetland Park. Due to these nature reserves, only one diving boat is allowed at a time. Of course, these regulations only help preserve this secluded 37-mile (60-kilometer) beach, which remains completely undeveloped to this day. There’s only one small resort, an eco-lodge with a few treehouses that offers the ultimate intimate experience. While here, you can also try a wildlife safari, bird watching or 4X4 trips in the surrounding virgin forests. 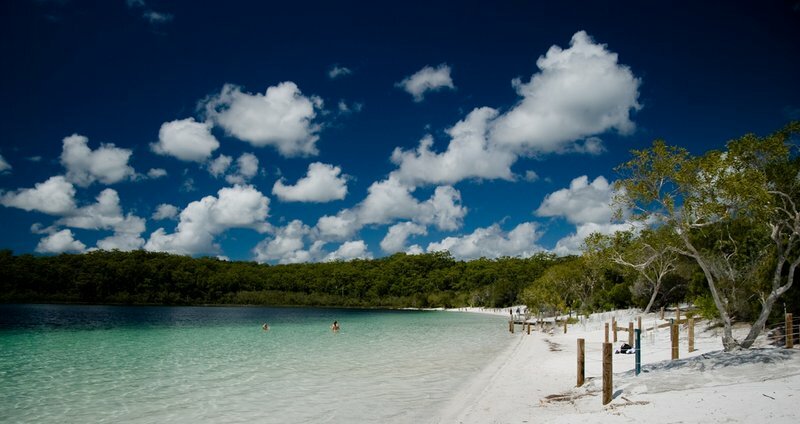 Just off Australia’s eastern Queensland coast, Fraser Island is the world’s largest sand island and the only place on the planet where rainforests grow on sand. There are 40 perched lakes on the island and over 100 freshwater dune lakes. 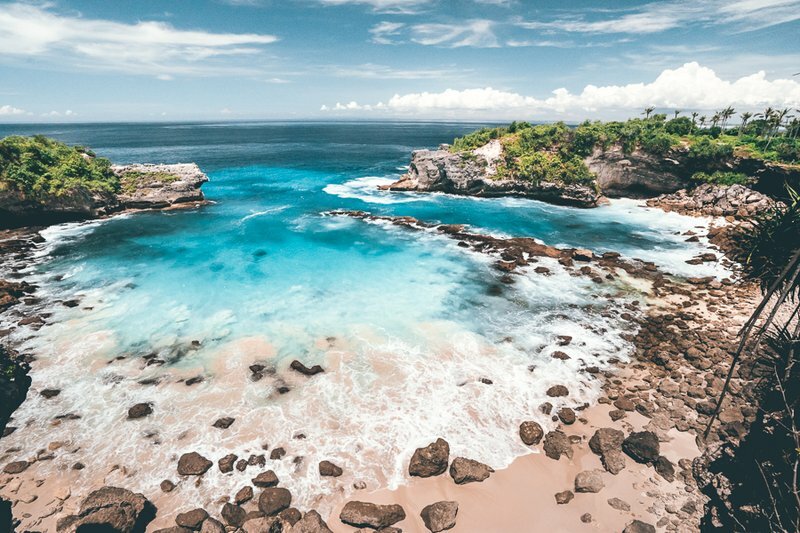 The latter are said to have some of the cleanest freshwaters in the world, and they await swimmers to dive right into their crystal-clear bright-blue water. These lakes are also among the dreamiest SUP destinations on the globe. At nighttime, you can either pitch your tent on the sandy beach or try one of the few resorts on the island. 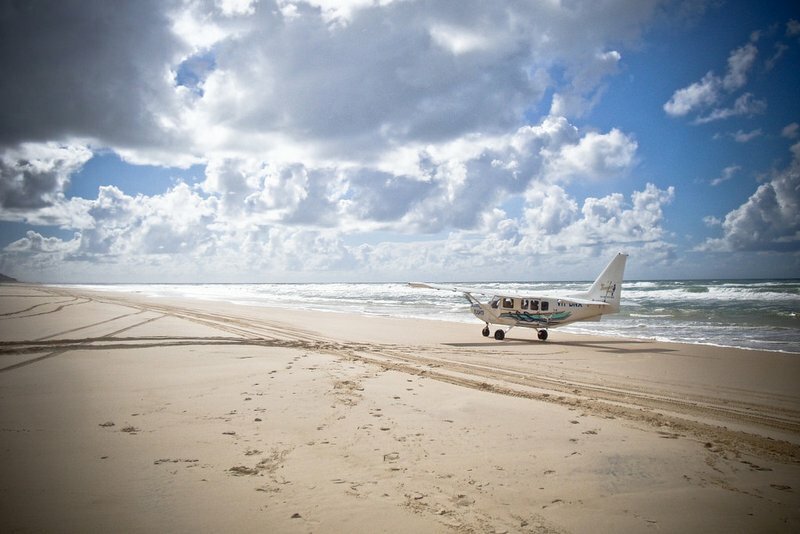 Finding your own private section on Fraser Island should be easy enough. The waters around the island have very strong currents and tiger sharks, which can be very aggressive. The best surfing areas are located between Indian Head and Waddy Point, but numerous shark attacks have been reported in these parts. 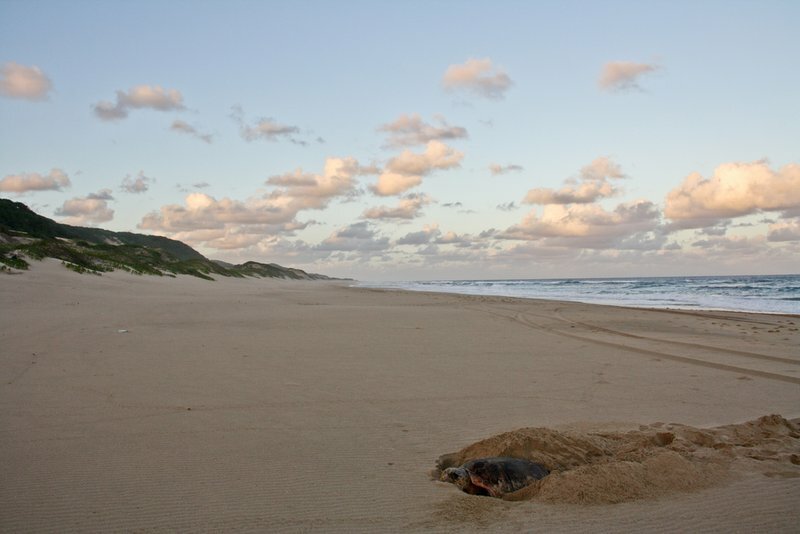 The famous 75 Mile Beach runs almost the entire length of the east coast. It is so wide that it acts as a highway for 4X4 vehicles and as a runway for planes. 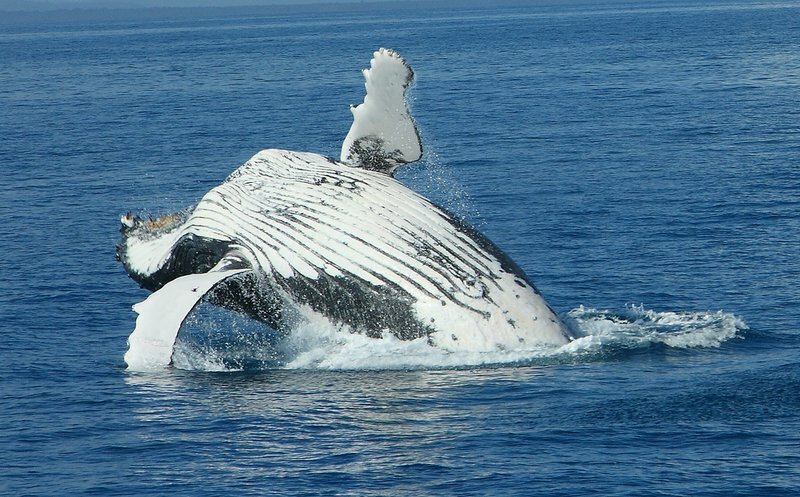 Make sure to visit during whale watching season and pay a visit to the Maheno Shipwreck as well. Due to strong currents and a large population of sharks, swimming here is not recommended. A well-guarded secret among Sydney locals, this tiny Pacific Ocean island has a tourist limit of 400, which mostly get around on bikes. 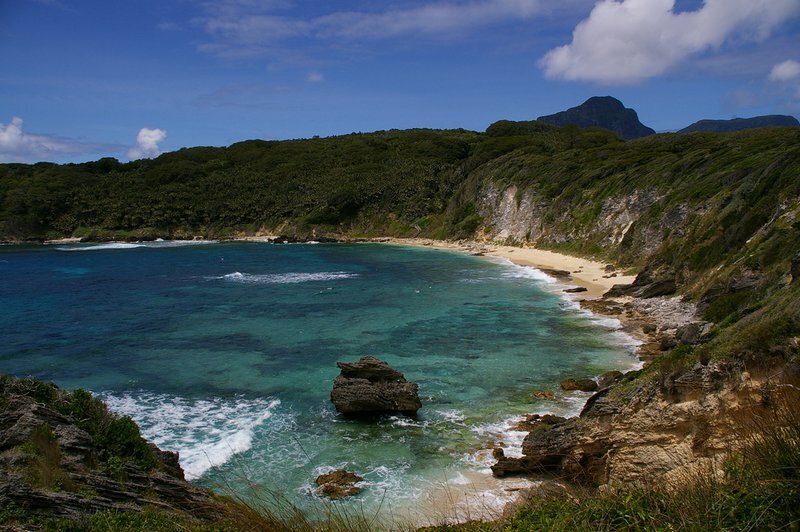 Adventure lovers will find plenty of activities to engage in on Lord Howe Island. The surrounding waters abound in marine life and there are colorful reefs quite close to shore just waiting to be explored on some cool snorkeling sessions or by SUP. At Ned’ Beach, you can even hand-feed kingfish. A two-hour flight from Sydney or Brisbane, Lord Howe Island is a UNESCO World Heritage Site, with basalt-stack mountains plunging straight into the sea. 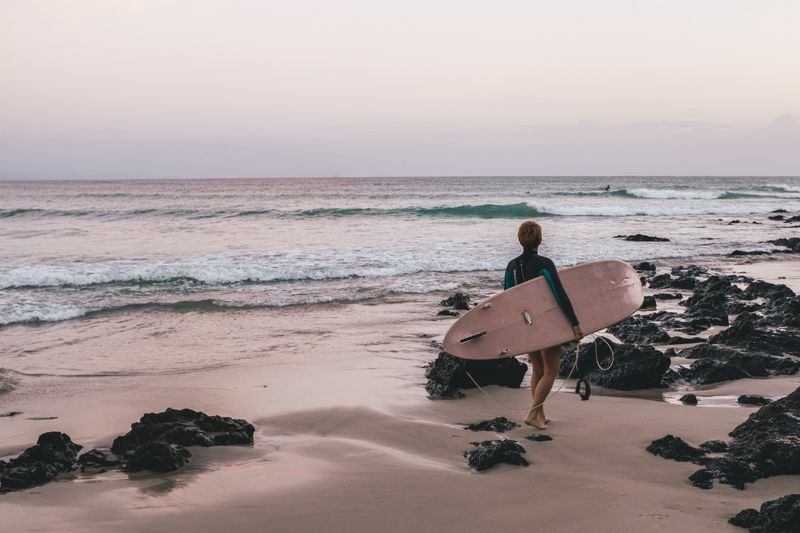 Visitors can climb the iconic Mount Gower, rising 2,870 feet (875 meters) above sea level, watch turtles laze around on Old Settlement Beach, or hit the amazing barreling waves at Blinky Beach, one of Australia’s least crowded surf breaks. 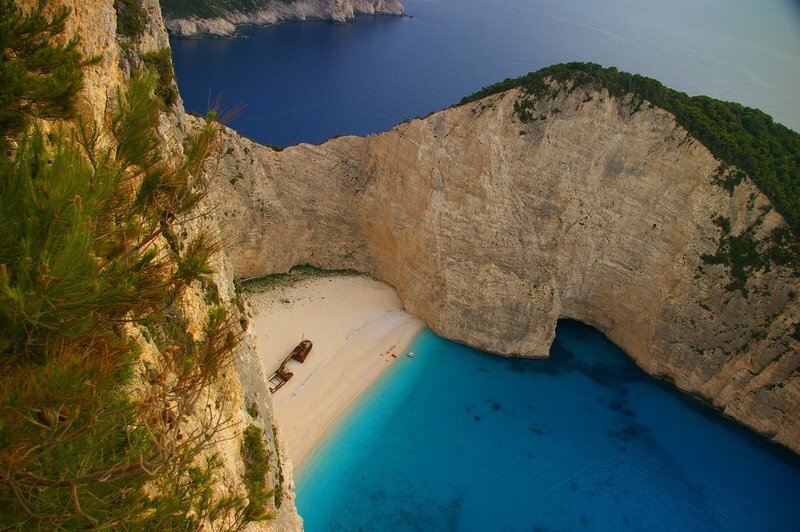 Also known as Navagio Beach or Smuggler’s Cove, Shipwreck Cove is one of the most photographed beaches in Europe. Located on the northwest coast of Zakynthos Island, also known as Zante, it can only be reached by boat. This small stretch of sand that opens to the Ionian Sea is surrounded by tall limestone cliffs. With pure white sand and surreal blue water, the beach gets its name from the rusty ship carcass that was left to rot on the sand for over three decades. Well, there would be another way to get to Shipwreck Cove, but this one’s reserved for adrenaline-junkies only: base-jumping from the 656 ft (200 m) tall cliffs. 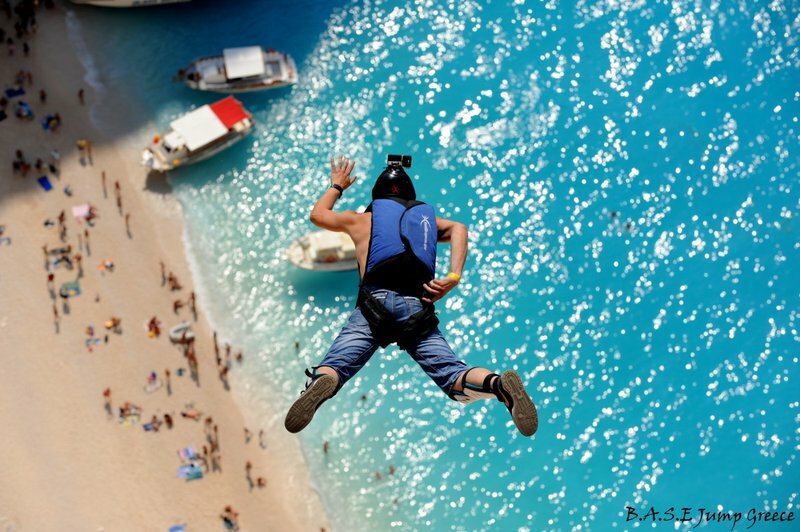 If having only two to five seconds to deploy your parachute sounds too extreme, you can simply try rope jumping (a hybrid form of bungee jumping) above the picturesque bay. 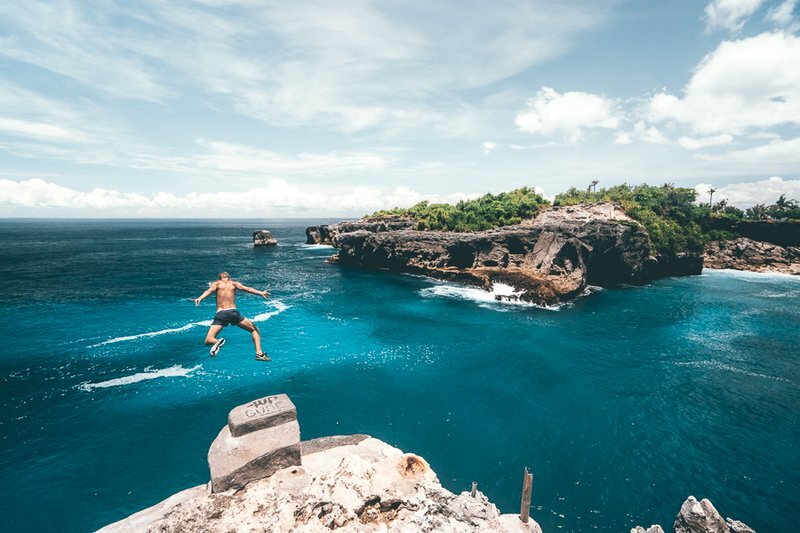 Off Bali’s southeast coast, Nusa Ceningan is a barely populated tiny island. Most of its coastline is enclosed by cliffs, but to the southwest of the island, these give way to white sand beaches just waiting to be explored by divers and surfers. 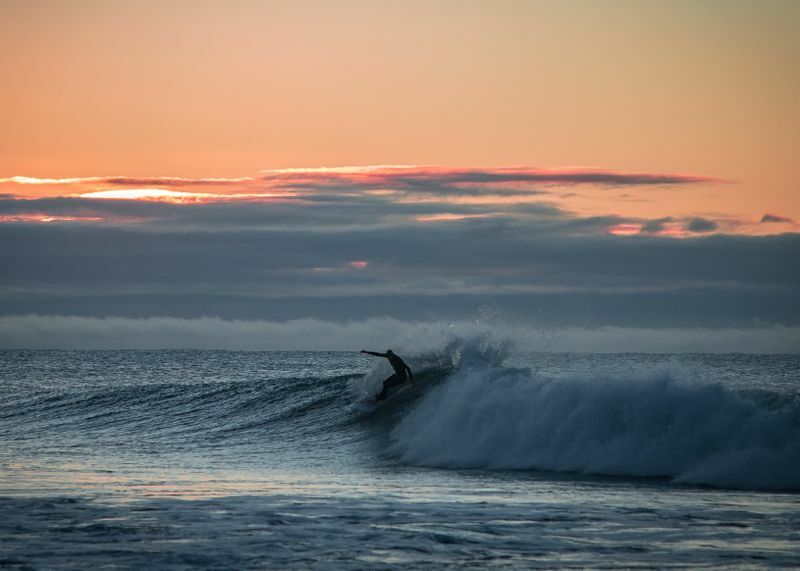 Mahana Point is an off-the-beaten-path surfing destination, with a world-class left-hand break that is best at medium to high tide. At low tide, swimming and snorkeling are at their best, with a wonderful coral reef on the east coast of the island. 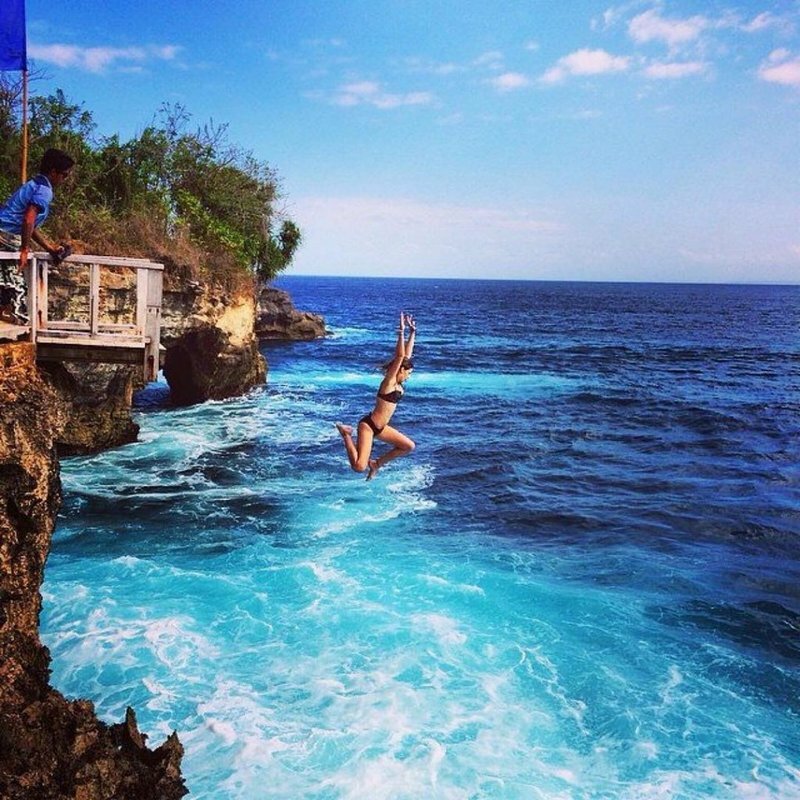 There’s also a cliff-jumping spot here at a surf bar overlooking the waves equipped with boards set 20 ft (6 m) and 33 ft (10 m) above the amazingly clear water. Mahana Point is also considered one of the best places to watch the sunset in the whole of Bali. Secret Beach offers one of the most spectacular diving spots in the whole archipelago, with clear water unlike anywhere else. The Blue Lagoon is a rocky cove with some of the brightest blue water you have ever seen. Swimming, snorkeling and stand-up paddling here is a definitive must. Not to mention there’s a cliff-jumping spot at the entrance of the cove. Looking for an adventure-packed getaway? 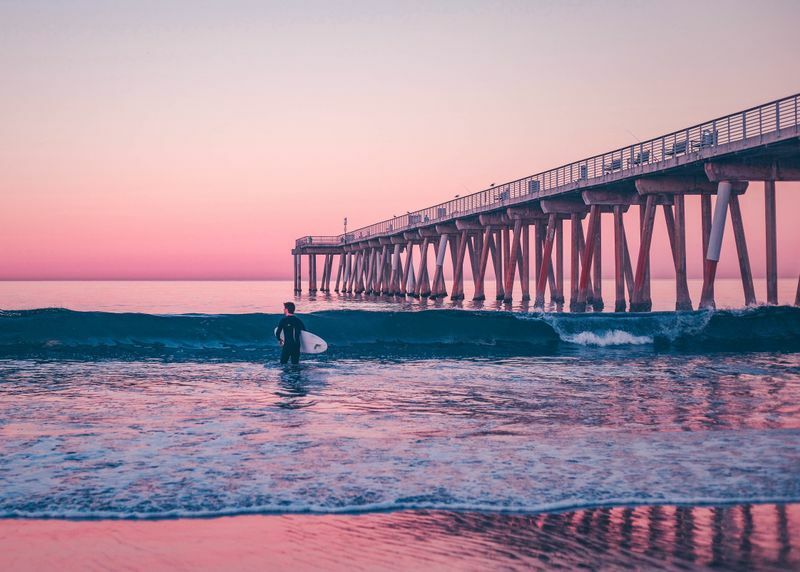 Try adding surfing or stand-up paddling to your bucket list the next time you hit the beach, and consider the above hideaways for your next vacation.